When it comes to the traditional desktop computer — or even laptops — there’s nothing more valuable than the keyboard and mouse. They form the basis of your interactions with the machine. Comparing that configuration to mobile, there’s no difference between it and the common touchscreen. But touchscreen-based and mobile devices also use a form of the keyboard, albeit digital in nature. You could argue the virtual keyboard is just as crucial to the user experience on mobile. 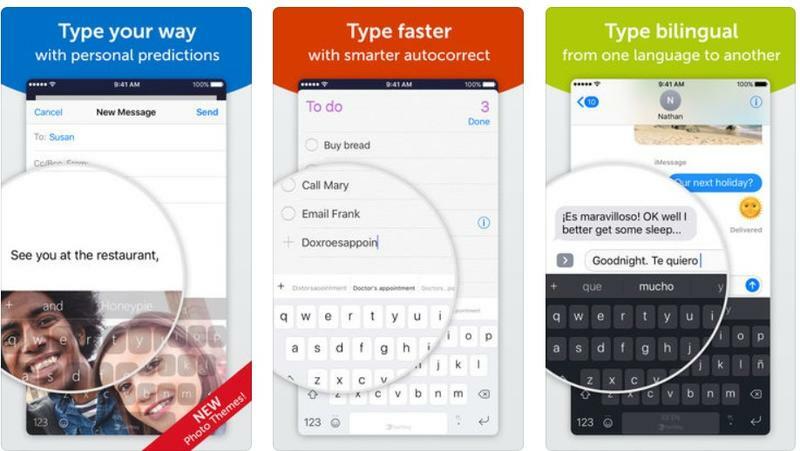 You use the keyboard to type messages, notes, search queries and much more. Without it, you’d have a tough time doing much of anything. A shoddy keyboard experience can make or break your enjoyment with a mobile device, just as it could with a desktop computer. If it’s too sluggish or obtrusive, you’ll have a tough time typing or choosing various keys. If the security is poor, your text, information and details may become vulnerable to third parties. If the colors and layout are wrong, you won’t be able to see the content, let alone interact with it. In short, many things can go wrong, even with a modern virtual keyboard. Luckily, a variety of apps are available — for both iOS and Android — that can alter your keyboard and typing experience, hopefully for the better. Up first is Gboard, essentially the stock keyboard platform for clean Android OS installations. Devices like the Google Pixel come with this keyboard pre-installed. But that doesn’t make it any less useful or convenient for everyone else. In fact, Google’s keyboard is one of the best available for Android, bar none. Surprisingly, it’s also available for iOS if you own an iPhone. There are no ads to contend with, no premium versions of the app locking you out of essential features, nor are there any other add-ons. You get full functionality, for free, right after install. You can also customize the look and feel of the virtual keyboard, from color to various themes or skins. My personal favorite feature of Gboard: its emoji search function. I don’t have time to remember where the poo or glitter emojis are every time I want to use them. 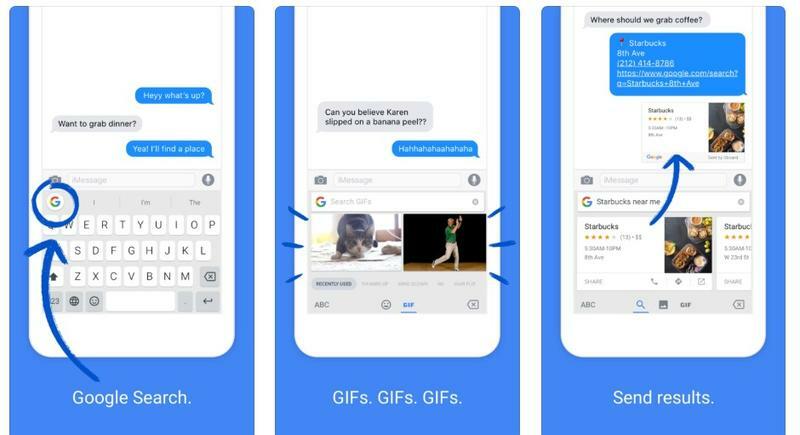 Gboard has an emoji search feature that will make you wonder how you ever lived without it. SwiftKey has been a mainstay in the Android ecosystem for a while, because of its robust features, extensive customization support and versatility. But it’s also available on iOS for iPhones and iPads, so keep that in mind. This keyboard is designed to make typing much faster, more accurate and more enjoyable. It includes a rich, dynamic built-in dictionary that is designed to recognize common mistakes and grammatical errors when typing and fix them automatically. If you input a custom phrase or word, you can save it for later, so the keyboard doesn’t autocorrect you. Furthermore, there is a huge library of customization profiles available, allowing you to personalize the keyboard exactly as you want it to be, from layout to themes, colors and more. It also has an emoji search feature. 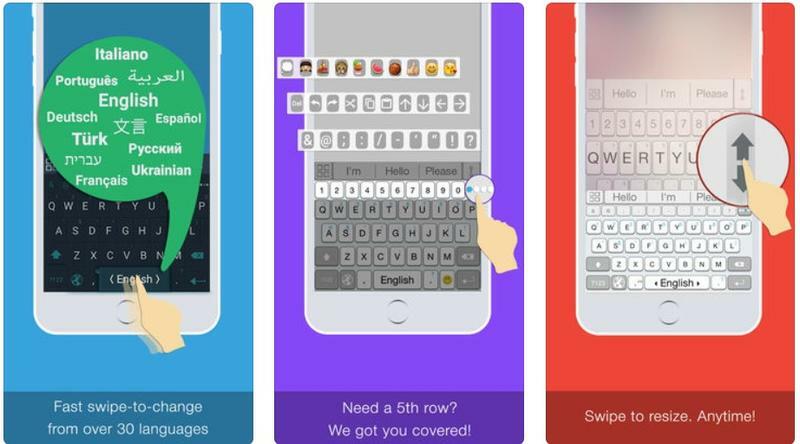 SwiftKey is free, and many of the themes and customization options are free, as well. However, some of the official skins and add-ons cost extra. You don’t have to spend money if you don’t want to, but the option is there. Fleksy is a bit quirkier than other keyboards, thanks to its fun, yet useful, features that differentiate it from other options on this list. 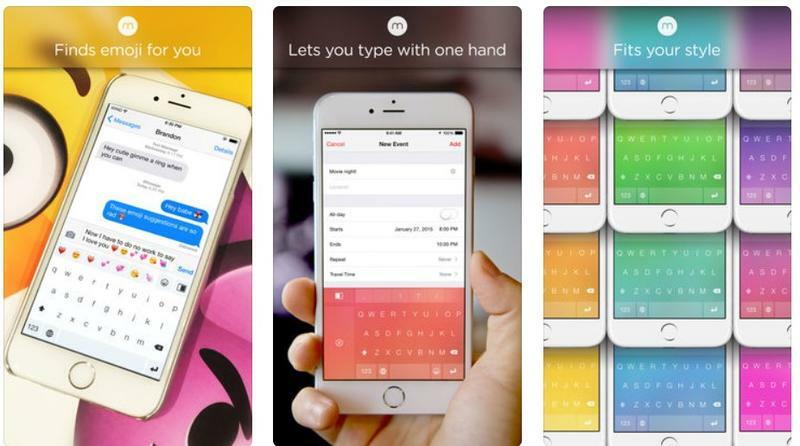 First and foremost, it’s a standard virtual keyboard with full functionality, including autocorrect support. However, with commonly used actions, you employ gestures and unique movements to interact with it. For example, after typing a word, you can drag your finger to the right side of the keyboard to include a space. You can also hold on the left side of the keyboard to delete the last word or letter you typed. You can use extensions to improve your Fleksy use further. For example, a numbers and symbols extension allows you to add this content right about the regular keyboard — by default, it’s hidden in a sub-menu. Other features include extensive language and customization support, complete with free themes, as well as a variety of additional extensions, further augmenting your experience. Fleksy is free to download and install on both Android and iOS platforms. Minuum is without a doubt the cleanest, most unobtrusive virtual keyboard alternative on this list. Everything about it is designed to take up minimal resources and screen real estate, leaving you free to go about your business. You can enable a full-sized mode if you need larger keys, using a simple “swype” gesture. Everything else is standard, including regular keys, various color options, gesture controls and more. Unlike some of the other options on this list, however, the personalization is quite limited. You can customize gestures, change the background colors and mess with some of the additional details. There are no full-featured skins or themes, however. There is a free version of Minuum for both platforms. The premium or pro version is $4 and includes more robust gesture controls and a unique “fast, sloppy typing” feature that helps you improve precision. 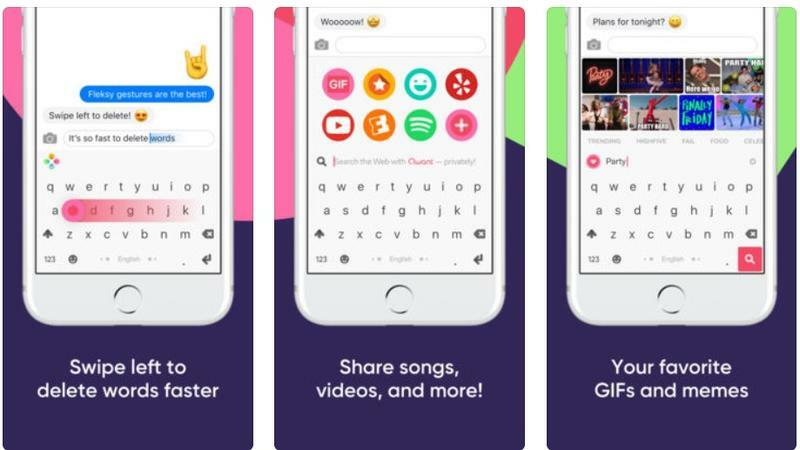 The ai.type keyboard uses next-generation — or “next-word,” as they call it — prediction, autocorrection and emoji support. As you type, the AI system will begin to predict what you’ll say next, similar to what you’ll see with the aforementioned SwiftKey. The biggest difference is that ai.type works more like a machine learning platform, learning to pick up your particular habits and language over time. You can personalize the app through various color schemes, skins and more. You can also completely alter the layout of the keyboard to match your typing style. The free version has plenty of features, but you won’t have access to several more advanced features unless you pay the $4 for premium. The good news is, you can download a trial version of the premium edition before you decide if it’s worth your hard-earned money.